Car buyers typically look at information like fuel economy, room in the cabin and other practical information when they consider their choices. If you’re checking out the 2018 Volkswagen Beetle Coast Convertible, these things might not matter as much as how the car makes you, and everybody around you, feel. In my week with this Habanero Orange model shod with retro mirror-like hubcaps, it seemed like this bug’s main strength was drawing attention and creating smiles. As soon as I saw the Beetle in Volkswagen Canada’s lot, I wanted to put the roof down. So that’s what I did. The power roof takes less than ten seconds to smoothly do its thing. Drops of rain immediately started to spatter the vehicle. So ten seconds later, the top was up again, as the rain-sensing wipers went to work. Fortunately, the drive home got drier and traffic slowed to a crawl, so I could safely drop the beige top, (as I did for almost every other drive that week). The 360-degree visibility I suddenly found made it easy to notice the glances this droptop draws. The overall shape hasn’t changed that much from the iconic look the people’s wagon brought to the world so many decades ago. Even modern touches like turn signals integrated on the rear-view mirrors don’t diminish the Bug’s – dare I say it – cuteness. The VW roundel on the trunk continues to serve as both the trunk switch and as a cover for the standard rear-view camera. That latter function keeps the camera lens free of road gunk. Beige peptic cloth covered the manually adjustable seats, complementing the beige roof and offering a counterpoint to the extrovert-pleasing orange outside. Dashboard accents in “surfwood design” i.e. light-coloured wood accents, contribute to the “day at the beach” vibe. In a nod to fuel savings, the Climatronic ® dual-zone climate control shuts itself off when you pop the top and activates itself when you put the roof up. Fail. There’s no other word for it. Don’t think about lugging surfboards with this droptop either. The bag and sticks had to ride in the back seat, with the sticks poking into the passenger-side footwell. This effectively turned the Beetle into a one-seater. The rear seats do fold down, but the opening is narrow. 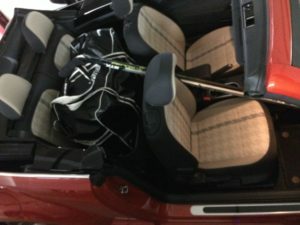 Partnered with the equally narrow trunk opening, the extended space might accommodate two golf bags positioned longitudinally. Cargo room isn’t limited by the drop top. It drops down to behind the rear passenger headrests, forming a large pseudo-spoiler, and takes up no trunk space. Cargo room is simply a shortcoming in the iconic design. The 6.3” touchscreen greeted my iPhone with CarPlay when I plugged it into the one USB port. The Beetle also supports Android Auto and MirrorLink. It may be time to develop screens that remain legible in strong sunlight. Given how much time I spent with sunshine streaming into the cabin, the screen was often washed out the way a tablet screen would be. Music from Sirius XM satellite radio and other audio sources can be powered to 400 watts thanks to the optional Fender system, featuring eight speakers plus a subwoofer in the trunk. Large speakers in each door are rimmed with ambient lighting. You control the colour of that lighting from the small group of controls on the dash behind the steering wheel that also includes instrument cluster lighting dials. The instrument cluster is dominated by analog gauges, with a small screen for various bits of information. This isn’t the highest-tech of cars. For instance, VW, left out the increasingly common drive mode selector. This Bug has only one on-road personality. Fortunately, that’s all it needs. A 2.0-litre TSI four-cylinder peaks at 174 hp and 184 lb-ft of torque. The 6-speed automatic handles shifts smoothly. This isn’t a barnstorming type of vehicle, but it’s zippy enough in the corners and offers all the fun you’d reasonably want. Besides, if you move too fast, you’ll miss all the admiring glances directed at this happy Bug. 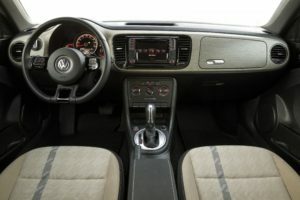 Given the Bug’s nature, I frequently found myself reaching for the gearshift, and feeling disappointment that all it offered was Tiptronic shifts. As much fun as the Beetle happens to be, a proper manual transmission would make it an absolute joy. Active safety options include blind spot detection and rear traffic alert. I could go on on about performance numbers. Fuel economy? Sure. VW claims 9 L100 km in the city and 7.2 L/100 km on the highway. I didn’t track it. 0-60 times? Yes. The Beetle Convertible covers all the bases reasonably. But there’s one attribute that doesn’t show up in the numbers. Wherever they appear, Bugs make people happier than most other cars out there. Drop the top on a sunny day, put a loud colour on it, and you’ll see this happen for yourself – and to yourself. There’s no apparatus, to my knowledge, that measures the happiness a car spreads. If anybody invents one, VW better measure its Beetle Convertible. I suspect they’ll find it’s a leader in its class. 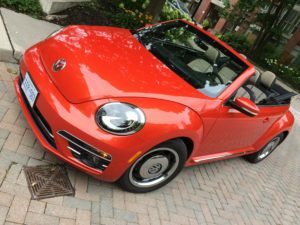 The base Bug sells for a touch under $26,000 MSRP. My tester, the Beetle Coast Edition Convertible with the P2Z – Style Package and excluding freight, PDI and excise tax on air conditioning, sells for $30,865 MSRP.